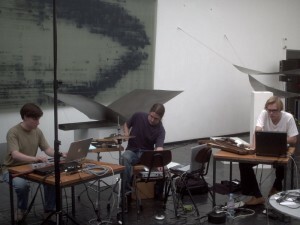 Endphase was started in 2003 as initiative of composers Alberto Bernal, João Pais and Johannes Kreidler (later substitued by Enrique Tomás). The goal of the project is to critically re-examine traditional conceptions of musical creation and performance and to create an environment in which a broad range of ideas, concepts and creative approaches can be realized, reinforced and informed by an appropriate and engaging æsthetic, stylistic and technical musical identity. Endphase was active 10 años, in which a big number of performances were done in different countries such as Germany, Spain, Portugal, Holland, Hungary, Ireland, Mexico, Austria, Norway or China.